Many Belizeans know 12 year old Madison Edwards. She is not your average pre teen. At 12 she is an environmental activist who for the past three years has been making waves with her powerful advocacy for the protection of the Belize Barrier Reef. Her positive mark has not gone unnoticed. 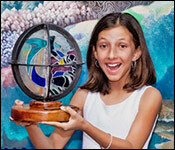 Last year she was honored with the Oceana Ocean hero award and now she has gone international. Yesterday the twelve year old was given the 2018 WWF Presidents Youth Award in Carteneja, Columbia. The award is given to people under the age of 30 who are making significant contributions to nature conservation. Edwards has a blog that helps bring attention and support to our environment. Her video blog also played a crucial role in mobilizing support against offshore exploration in Belizean waters.